Arvo Part rarely ever slips up on any of his releases, and this collection is another great release. It comprises mostly of renditions of Fratres, some of which are arguably necessary for the piece to have everything it has to say gotten out, but some are a little less exciting than others. We all know which version of Fratres succeeds the most completely…The solo violin on track two is probably the most crystalized emotion of all of Part’s tintinnabuli pieces. However, other versions are also interesting…Cello and Piano and String Quartet are also nice renditions. But the album is exhausting to listen to all in one place. There is such a thing as too much Fratres, even for Part fans. The other three pieces in the collection are equally as notable and could have been given as much attention. 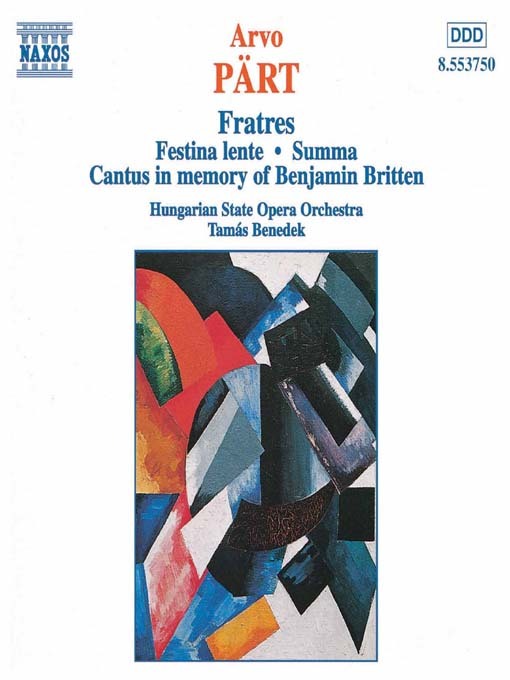 Festina Lente is a wonderfully tragic piece, while Summa is a bit more abrasive but equally emotional. The collection is clinched with the classic recording of Cantus in Memory of Benjamin Britten, probably the finest tintinnabuli piece. Part composes simply wonderfully here, cascading the strings down towards a watery abyss where all of our emotions rest; fear, sadness, happiness, anger, love. It is all consolidated at the bottom, and it is a pleasure to reach it. This might not be the best Part collection to date, but fans of Fratres who want to hear the piece given more attention couldn’t go wrong with this. Hi, nice blog, found it through MT.. I like your post, i’m only just discovering more of Arvo Part but so far his compositions are utterly beautiful.